To say I was excited going into this one would be a vast understatement. 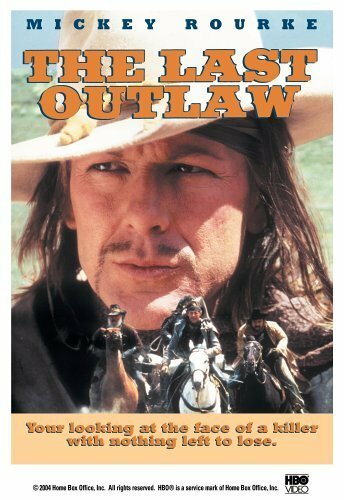 Made by HBO in 1993, The Last Outlaw boasted the writing talent of Eric Red, whom I've loved with his work on The Hitcher, Blue Steel, Bad Moon and Body Bags. I know he also co-wrote Near Dark, and as much as people love that film, I could never connect with it. Director Geoff Murphy is at the helm, and after having recently been blown away by his work on Freejack and Young Guns II, I just knew he was the right man for the job at the peak of his career. Another western from Murphy? Written by Eric Red?! SOLD!! 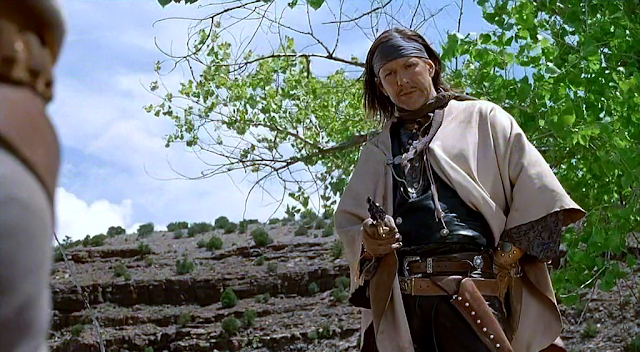 The Last Outlaw was a solid and entertaining western, but it didn't blow me away. I liked it, but I didn't love it. Of course I went into this with rather high expectations, so I was pretty sure that the film itself couldn't meet them. But there was always hope, because Young Guns II was such a surprisingly excellent western from the same director, and while there is some really fantastic camerawork going on, the fact that it's not available in widescreen was frustrating to say the least. It being an HBO production shouldn't make a difference, since Full Eclipse was also an HBO production, yet you can easily get that film in widescreen on DVD. But for some reason this one, you cannot. And honestly, widescreen would have added so much depth to the film, being able to take in Murphy's excellent camerawork and the huge sweeping vista's of the desert landscape could only be made possible by utilizing it's full widescreen scope. But alas, what we're left with is full frame. If there's anything that's going to standout in this film it's the excellent cast, starting with Mickey Rourke. While he doesn't show much range or emotion in here, instead playing it calm and cool, he can still carry a film quite effectively, even if he comes across as not really trying very hard. And I have to admit, he looks so strange here. There are so many changes to his face from the last film his previous film that it's oftentimes difficult to look past anything other than his ever-evolving face (what's up with his eyebrows??). But the real standout has to be Dermot Mulroney. You've seen him in countless things, including the first Young Guns, but I'd never seen him deliver such a commanding performance. While Rourke is technically the star, Mulroney delivers the best performance and in reality, has more screen time. Too bad he didn't get top billing with Rourke. In addition, the rest of this excellent ensemble cast constantly impressed me. How could it not? We have Steve Buscemi, Ted Levine, Keith David, John C. McGinley, Gavan O'Herlihy and countless notable character actors, all delivering the goods and giving the film some real star power. I think one of the issues I had was that this film in general just wasn't very exciting. While there are several shootouts and some tension/suspense, there just doesn't seem to be enough action, violence, excitement, thrills and even tension to really keep your attention. Sure it's a pretty movie to look at, but really, it lacks in any real kind of punch. It's entertaining enough, but nowhere near as badass as I was hoping for. It tends to drag for long stretches of time, and with the amazing talent behind it, I was expecting it to be much more brutal. Instead it all feels too safe, and that's the last thing I was expecting from this. Perhaps some tighter editing would have helped it's structure, but I guess we'll never know.. The Last Outlaw has so much incredible talent behind it that even though it was technically a Made-for-TV production courtesy of HBO (back when they were killing it with original content), the tour de force of talent behind and in front of the camera should have guaranteed a knockout. It's a good film, don't get me wrong, but I can see why it never really reached cult status the way other HBO productions did. Too bad too, because all the right ingredients are there, sometimes staring you right in the face, yet rarely ever used wisely or to their full effect. It's a bit abhorrent in that regards. It could be great, but it's just good. It's available on DVD for anywhere from $10 - $40. And mind you, that is for a full frame movie with zero special features, so the steep price kind of battles me. 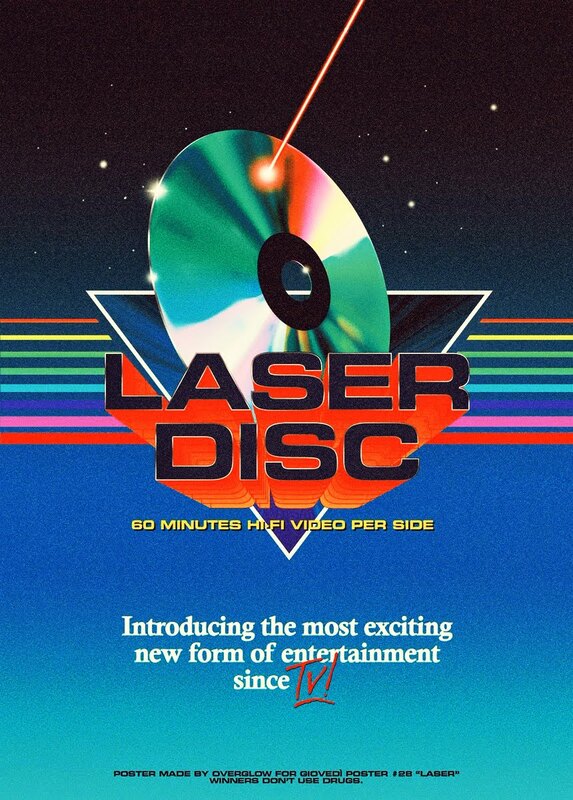 You can usually pick up the Laserdisc for much cheaper than that (also in full frame), but I have yet to see a VHS of it, but I'm sure it exists. As far as I know, I've never come across it streaming on any of the major streaming sites. It's not available on blu ray either yet.